The land of Skyrim is home to many things, including the Nord, Giants, Frostbite Spiders, but none so fierce as the mighty dragons that fly around this frozen playground terrorizing civilizations and eating mortals as they please. But before you are ready to slay these scaly birds you must strengthen your skills and survive a civil war that has broken out between the Imperials and Stormcloaks, on-top of discovering your heroes role as a Dragonborn. “The Elder Scrolls V: Skyrim” follows a new trend in role-playing games where a large list of classes isn’t required to make a more versatile game. Your class is determined by how you play; an axe wielding barbarian can easily become a fire launching sorcerer. To help bang out the edges on these kind of transitions, developer and publisher Bethesda decided to add guardian stones. Guardian stones are scattered rock formations that can be activated to boost certain skills for a limited amount of time. Each skill naturally grows when used, but by opening the “Skill” interface characters can select multiple perks for any one skill. So if your favored craft is blacksmithing, every level you can spend a perk learning different styles of smithing such as dwarf, elf, orcish, etc. Every gamer should applaud the interface in Skyrim because it is easy to use by being quick and organized. The interface is also valuable to gameplay because it sometimes has to be used in order to complete a quest. An example of such usage is examining an artifact or object and memorizing its pattern to open a door in a certain dungeon. That brings up the forgotten stepchild of this game. Nobody will take notice, but everyone will love the clever thought process the game that players to go through in order to carry on to the end of a dungeon. It is a game that makes you think, not that it will ever be a a game in the Portal series, but a dungeon is more than just a cave you get lost in. A dungeon is an underground fortress with its treasure waiting to be found. When the map for Skyrim was made, it wasn’t made with presets. Everything Bethesda put on that map was manually placed to create a unique open world big enough to support a flock of dragons. The player can tell where he is, not by staring at the map, but by looking at surroundings. Is there snow, are there bones, is there a fuzzy giant three-eyed abomination out in the distance? Then you are probably in the mountains about to be eaten alive by a hungry frost troll, which would place you somewhere between Whiterun and Windhelm. There is one thing that is misleading about Skyrim, though, and that is when you are playing you are deceived into thinking you can defeat anything. Overtime it becomes obvious that your body will be floating down the river once or twice every couple of hours. So please don’t fight giants at the first level, save as frequently as possible, and prepare to lose track of time for the next two weeks. 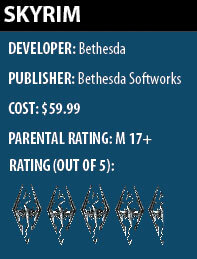 “Elder Scrolls V: Skyrim” earns 4.5 dragons out of five for being everything we love in an role-playing game and having a great atmosphere.